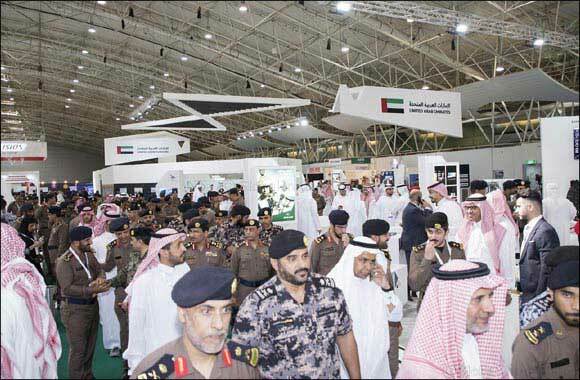 November 04, 2018: The Emirates Defense Companies Council (EDCC), is taking part in the Saudi National Security and Risk Prevention Expo (SNSR), which opened today in Riyadh and is being held under the patronage of HRH Prince Abdul Aziz bin Saud bin Nayef bin Abdul Aziz Al Saud, Interior Minister of Saudi Arabia. Patronized by Tawazun Economic Council and organized by the EDCC, the UAE Pavilion at the SNSR features 25 leading Emirati companies, specialized in defense and national security-related products and services. Sultan Abdulla Al Samahi, Acting General Manager of the EDCC, said the UAE Pavilion is the largest of all 19 national pavilions taking part in the Expo, including those of Saudi Arabia, France, Germany, Spain, Italy, the United Kingdom, the United States, Denmark, Sweden, Switzerland, Hungary, Kuwait, South Korea, China, Cyprus, South Africa, Belgium, and the Czech Republic. “This is UAE Pavilion’s biggest participation in international events, with a booked space of 1,200 square meters, said Al Samahi. UAE’s strong presence, he continued, is a reflection of the deep-rooted fraternal ties between the UAE and Saudi Arabia, under the wise leadership of President His Highness Sheikh Khalifa bin Zayed Al Nahyan, and his brother, the Custodian of the Two Holy Mosques, King Salman bin Abdulaziz Al Saud. The UAE Pavilion will display Made in UAE defense and security-related products and services, including autonomous systems, mapping, telecommunications, maintenance and repair operations, cybersecurity, logistical support and technical development. Among the companies, taking part in the Pavilion is Emirates Defense Industries Company (EDIC), a national leader in military industries comprising many companies that operate in various aspects of military industries. EDIC’s stand will feature products by EDIC Caracal International, a small arms manufacturer that develops and produces a wide range of modern firearms. Barij Dynamics will display its latest products of precision-guided systems for conventional air munitions, while Barij Munitions will highlight its wide range of small arms, infantry, artillery and other ammunitions. Etimad Holding, Remah International, International Golden Group (IGG), a leading supplier of high-end defense and security solutions, is also taking part in the event under the umbrella of the UAE National Pavilion. The Pavilion will also host Etimad Holding, and Al Yah Satellite Communications Company (Yahsat).